We all learn by doing. 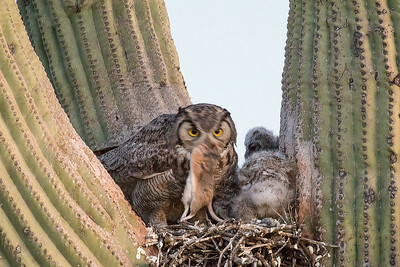 So it is that my learning curve has been on the upswing for the past month since being smitten by a tribe of unlikely subjects: great horned owls. 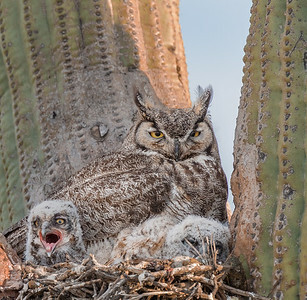 Like all photographic projects there’s many ways to approach documenting the great birds. There’s the easy way, with a couple nice images from a distance; and the there’s the more involved difficult path of long lens photography in unforgiving conditions. Because of my penchant for suffering, I chose the later. 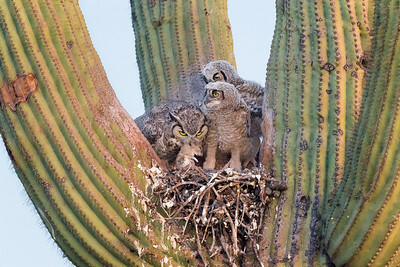 Armed with my trusty Nikkor 500mm f 4.0 lens with a couple tele-converters (1.4X and 2 X) I resolved to get images that showed the owlets up close and personal. Nikon released their brand new D5 camera in time for me to utilize its higher resolution, faster auto-focus and incredible low light capabilities for my owl hunt. There are problems to overcome. I needed to maintain distance so as to not disturb or stress the subjects. That meant I would be using very long focal lengths to both “see” into the nest and capture intimate details. I’d needed to photograph well after sunset in extremely low light, which introduced several other problems to solve, like maintaining a fast enough shutter speed to stop camera shake and subject movement. I found myself constantly trying for a “sweet spot” of optimum quality with minimum noise. Additionally, auto-focus suffers from both low light and at the f stops (f 8.0) achieved using a 2X tele-converter making my 500mm into a 1000mm beast. Therefore much time was spent dialing in combinations of just enough high iso to get the action, yet present a publishable image quality. I solved the problems one at a time knowing that I needed to tailor my approach to a certain behavior. 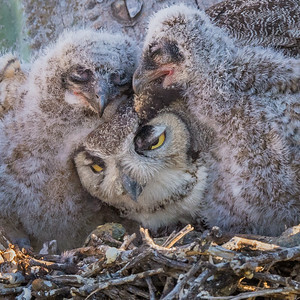 For instance, if I were after details in the nest, I would set up my 500mm lens with a 2X extender, on a very stable platform that could not respond to fast moving situations. The lens was attached to two large tripods and centered on the portion of the nest where I anticipated the action. I then used live view auto-focus to make sure focus was spot-on. Once accomplished, I attached a cable release to avoid access vibration. Now I was free to shoot slower shutter speeds, yet maintain very high quality. Conversely, I had to totally abandon that set up and use the 500mm lens alone or with a 1.4 tele-converter to follow action. This is where commitment to one approach or another can really produce frustration. Inevitably, when set for extreme details, a parent owl would fly by presenting an opportunity I could only lust after…but never capture. The beauty of commitment to a project is that there’s always tomorrow…sometimes. I am essentially a landscape photographer, but I’m also a curious naturalist. And perhaps, that’s the most important attribute for photographing feathered subjects. By studying their behaviors and their feeding schedules, you begin to understand the best time frame for potential successful opportunities and anticipate the best lens combination. Once you accept that you will fail at many attempts, you’re free to experiment and enjoy the experience. So celebrate each failure as a step toward success. #1 I shot this at iso 32,000 in near total darkness with 1000mm lens at f 9.0 at 1/25th sec. This was the failure that forced me to rethink my approach. 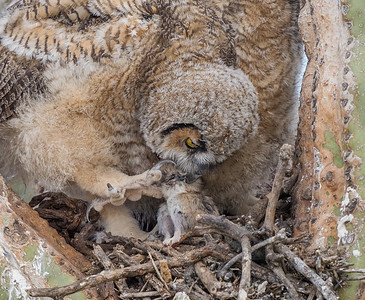 I resolved to shoot faster shutter speeds to get higher quality parental feeding images. #2 Hungry babies squawking was made with 1000mm at f 11.0 at a 1/2000 sec at iso 3,200. #3 Parental over-load was made using the 1.4X producing a 700mm lens at a 1/1000sec at f 9.0 and iso 2,000. #4 Mama owl bringing home the packrat was made with a straight 500mm lens at iso 16,000 exposed at f 5.6 at 1/60 sec. #5 Parent owl perched near the nest before bringing home the dinner. 1000mm at f 9.0 at 1/1250 sec., iso 3,200. #6 Owlet taking a stroll in preparation for flight. 700mm, f 5.6, at 1/200 sec, iso 10,000. 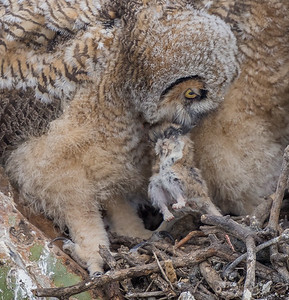 #7 Owlet with packrat dinner. 1000mm, f 10.0, 1/800sec, iso 1,600. 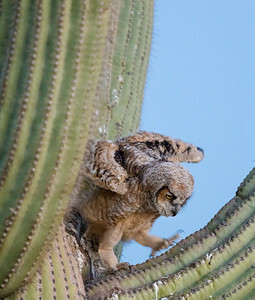 #8 Intimate close-up of owlet and pack-rat, 1000mm, f 10.0, 1/640sec at 1,600 iso.